Truly OEM silicone tubing for the Plenty. Thank you so much as not many other shops online or other wise carry these! Returning customer for sure. Recommended - Review by Gwendolyn J. Your store is always great at giving me the help I need and getting purchases shipped out soon. I recommend this site to anyone. 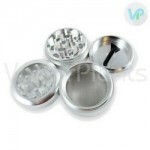 Great service - Review by Carmen D.
I found this site when I was looking for new screens for my vaporizer. I got better service from this company on my small purchase than I ever did from other stores on larger purchases. For this reason, I don't think I will ever go back to another site. Thanks, Vapor plants. Low price and authentic - Review by Bobbie A.
I got my vape from this company a few months ago. I am impressed with my vape and love it almost as much as I love VaporPlants. Everything came out perfectly, was processed on time and shipped right away. You definitely already had the lowest price out there, but it was the service that made this site truly stand out for me. I will shop again and again with VaporPlants. Shipped right away - Review by Edith I.
I am a long time customer, and every single thing I have purchased from this site from the batteries to the vape pens themselves have all been high quality and shipped right away. Easy to clean - Review by Tommy N.
I was worried that the Plenty Vaporizer would not be easy to clean but I was proven wrong. It's just as easy to clean as it is to use. This vape and accessories are wild.